WTS Energy provides employees with competitive pay and comprehensive benefits program that will allow you to develop professionally and reach long-term goals of the race. The balance of Work / Life is encouraged at WTS Energy and the company offers several programs like “live like work” that offers advice, referrals and resources on parenting, career planning, family care and leaves of operation (planning) education. Other benefits include flexible work arrangements with supervisor approval, adoption assistance and dependent care spending accounts. 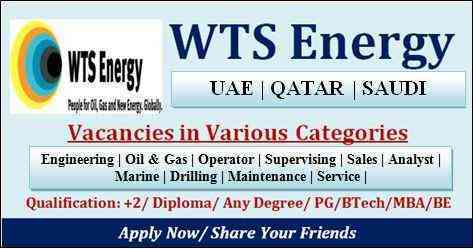 WTS Energy also provides other pay and competitive advantages.